Once in a while we get to see some very unique solutions in home security cameras. The Reolink Keen is one of those products. It’s the first truly wireless pan and tilt camera we have seen. We’re talking wireless on the power as well as connectivity. We’re always interested in looking at new products and were intrigued when Reolink asked us to look at their wireless entry. Sure, we’ve seen wireless before with the Blink and Arlo line of cameras. Combining that feature with a larger pan and tilt is a first for us. Our test model arrived several days back so let’s take a detailed look at the Reolink Keen Wireless Camera. You can access the Reolink Keen Wireless Camera with your smartphone using the ReoLink app for iOS or Android. The smartphone app is easy to use. Multiple Reolink cameras can be supported from the app. The app is the only way to access the camera and all setup is done from here. There is a small pamphlet included that walks you through the setup process. The setup is facilitated by scanning UID codes from your phone, entering the wireless password, then scanning a UID code on your phone by the camera. Unlike many other home security cameras, the Reolink cameras don’t have an account on a central server controlling access. It’s done via the individual camera. Each phone is initially authenticated using the same UID scan so figure out which phones you will be using now. Having to remove the cameras from their perch to authenticate a new phone later is time consuming so try to get all the phones out of the way at first initialization and before you get it permanently positioned. The manual is very short and includes little information beyond the setup. Use of the app is fairly intuitive but we needed to contact the manufacturer on one occasion to figure out how the pan and and tilt function worked. Their response was within a day and they can be reached at support@reolink.com. Motion detection is facilitated through the PIR sensor settings. A schedule for notifications can be established. Notifications can be sent using email or push notifications to your phone. Before using email, you need to set it up through the app. This requires entering the name of your SMTP server and port plus the user and password for the email account. The SMTP fields are pre-filled for a gmail account. We recommend establishing a secondary email account with an SMTP server to avoid entering your primary email password into the application. Ideally, it would be better to have the option of using the manufacturer’s email system for this purpose, but this type of setup isn’t all that unusual. You can also be alerted via audio using the setting under the PIR selection. Absent is the presence of motion zones to limit the field of view for motion alerts. This feature is nice to have for eliminating false motion alerts. The absence isn’t surprising given the separate PIR motion detector feature. Video quality selection is made from the settings. Reolink uses the term “Clear” in the settings to mean 1080p. Lower settings are available such as 720p. Depending upon available bandwidth and connectivity strength, choose the video stream that works best. This is a battery operated camera so the application provides a means to monitor battery usage. Using the Battery selection under System Settings brings up a calendar and summary of battery usage by day. The last 28 days of use are shown. Current battery strength is shown on the primary screen display with the usual shaded battery icon. No cloud storage with the Reolink Keen however the camera does support use of an on-board SD card. According to Reolink, a future cloud offering is in the works. There does not appear to be any integration with third party apps like IFTTT. Being able to set other events in motion when movement is detected would be a nice feature to have in the future. The Reolink Keen is a large camera. This isn’t surprising. A pan and tilt camera is always larger than a stationary lens variety. The Reolink Keen measures almost 5 inches high by 4 inches deep. It weighs in at almost 14 ounces. These are indoor cameras and not recommended for outdoor use. The company recently introduced their Reolink Argus for outdoor use. There are some wireless home security camera competitors out there such as the Blink Home Security Camera and Arlo Pro HD Home Security System. The Reolink Keen differs in the way it connects to the router and we are fans of the way they do it. The Blink and Arlo entries provides a separate hub which connects to your wireless router. The Reolink Keen has no additional hub. The camera connects directly to the wireless router. That’s one less piece of hardware to worry about. The Reolink Keen is a truly wireless solution. That means no wires whatsoever. No A/C power plugged into the wall. It’s powered by batteries. The Reolink Keen uses four CR123A batteries. There’s a battery life indicator within the app. Reolink does not provide rechargeable batteries. The manufacturer predicts a battery life of 500 minutes of recording and up to 180 days of standby time. Your results will vary depending upon the amount of camera usage. The more it’s used, the less the batteries will last. The batteries aren’t overly expensive but it’s something to be aware of. When it’s time for new batteries, we always recommend sticking with brand names such as Energizer or Duracell. Consider the Energizer 10-pack CR123A Lithium Batteries. It’s got more than enough for a complete change out of the four batteries in the camera. Since lithium batteries have a very long shelf life, it’s safe to buy them in quantities and store them away for later use. Sound is provided through speakers on the side. A two-way conversation can be held by pressing the microphone in the Reolink app. Voice quality is about average for a home security camera. Pan and tilt cameras are unique in that you can cover a wide swath of territory versus the fixed lens varieties. The Reolink Keen covers 355 degrees around. That’s covering in front, the sides and behind the camera. This is controlled from the app using the PTZ selection. It’s a little tricky. Push the center button and drag in the direction you want the lens to turn. Now hold it for as far as you want the lens to turn. It also swings 105 degrees top to bottom. You can see the ceiling or the floor. Nice range for a pan and tilt camera. The 1080p lens gives a nice clear picture during the day. The lens has a 90 degree stationary view but as discussed in the previous paragraph, that’s greatly expanded with the pan and tilt feature. Acceptable night vision is provided with typical IR lights with a manufacturer stated distance of up to 12 meters (about 36 feet). Recording to an SD card is provided with an on-board slot which will hold up to a 64 GB card. Use this feature to record video history. Since no cloud service is available with this camera, this represents the only way to record video history. Connectivity to the router uses the 2.4 GHz band using 802.11b/g/n. The 5 GHz band is not supported. The Reolink Keen Camera comes equipped with a plastic wall mount that’s adequate for attaching the camera to a vertical flat surface. A second mount for the PIR motion sensor is also included. If your mounting requirements are as simple as attaching to a wall, these should work fine. Most pan and tilt cameras are used on a tabletop so you may not use the camera mount at all. This is the first camera we have seen that includes a PIR motion detector as a separate accessory. The advantage is the opportunity of better coverage by placing it high up in the corner of the room. While you can place the PIR sensor on a table, better coverage will be obtained by mounting it higher up in a corner. 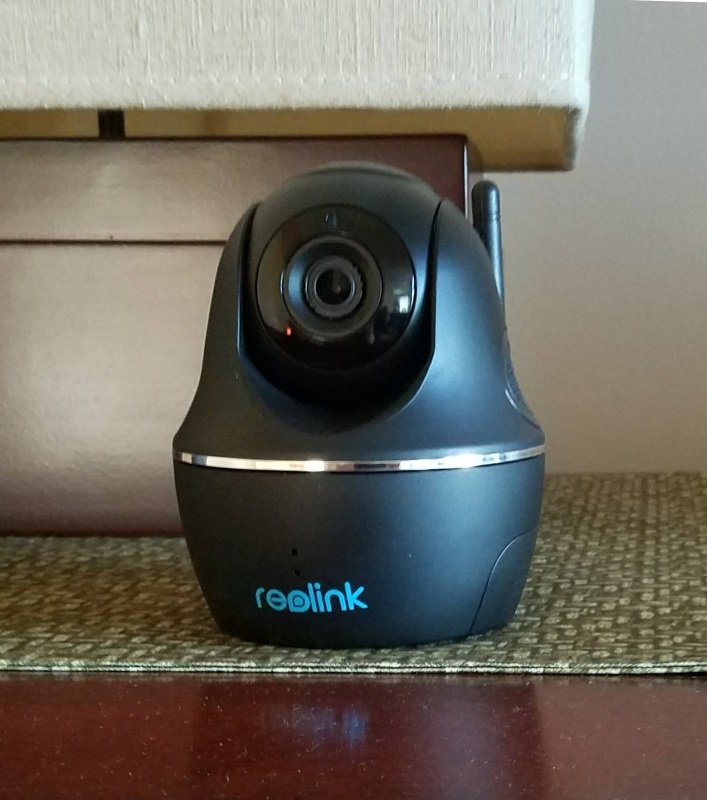 The Reolink Keen is a good home security camera for those wanting to combine a pan and tilt feature with wireless power. It’s a nice entry for those needing to see a wide landscape and not having a power receptacle nearby. We recommend the Reolink Keen for those seeking software simplicity and hardware versatility at a reasonable cost.